While Music Duplicate Remover can work with duplicates in mixed formats (for example, find OGG duplicates of a song in FLAC), for the sake of simplicity we will consider removing MP3 duplicates. Keeping in mind that this can be applied to all supported audio formats. Each MP3 file has 3 sets of properties: the file itself (its size, filename, etc. ), audio data and ID3 tags (title, artist, album, cover art, lyrics, etc.). When comparing files manually, we mostly use audio data (listening to the music and deciding whether it is a duplicate or not), but this method takes lots of time. A program would prefer comparing exact data like file size and ID3 tags. But very different files may have the same size, and ID3 tags may be unavailable. Music Duplicate Remover can compare various exact properties of MP3 files and ID3 tags. Additionally it can use a special algorithm to check audio data. 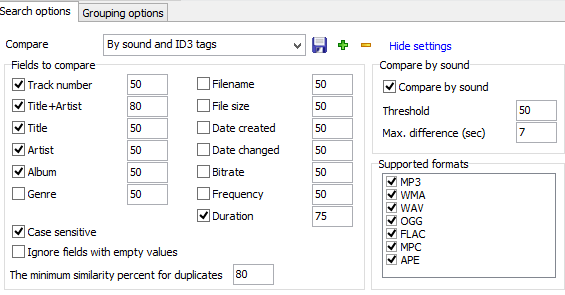 While the latter method is slower than comparing ID3 tags, it allows detecting duplicates with empty tags. If many files do not have any tags at all, you can fix this with mp3Tag Pro first (for example, extract tags from filenames, which will not take much time). If you do not want to fix any ID3 tags, consider running the pure "By sound" method. Using the combined method in the situation when there are many files without tags is less efficient. Running Music Duplicate Remover two times, using the two search methods separately, may deliver better results. Try searching first by ID3 tags and then by sound. When searching by tags, you can assign different weight to ID3 tag fields, depending on the situation with tags in your files. Pre-configured values are good for most cases, but adjusting them may deliver better results. When comparing ID3 tags and checking files that do not contain some or any ID3 tag data, the program has two options: presume that the empty field is not equal to the same field of the other file or simply ignore the field and give more weight to other fields. Music Duplicate Remover uses the first approach, but you can change this by enabling the "Ignore fields with empty values" option. Saying that two empty fields are not equal to each other may seem strange, but let's consider alternatives. If we take that all empty fields are equal to each other, all songs without tags become duplicates (which is not true). If we ignore empty fields with the settings like on the screenshot above, all audio files with the same duration will be listed as duplicates (also wrong). The default value works correctly here. Further information about settings and other features you can find in the help.